Rereading a favourite classic at different stages of your life gives you different insights with each reading. Is there one classic you’ve read several times that also tells a story about you? I’ve read a few books more than once or even more than twice. I’ve certainly read Rebecca a number of times and also a few of Austen’s and Dicken’s works but I’m not going to use one of those as examples because I think I only had a few years in between each reading. I did read Lord of the Rings when I was about 15 and apart from the fact that I loved the story and the writing I also had a total girly crush on Aragorn – although according to the book he’s not exactly easy on the eye. I don’t care, he’s a ranger and he’s hot (in my mind). I then reread this very recently as a group readalong and I think if anything I actually liked it more. I don’t know whether that’s anything to do with the age difference, the fact that I just love the story or because I’ve watched the films (quite a few times). Yes, I still liked Aragorn – and you can all go swooning over Legolas in the movie but Viggo Mortensen is my favourite, but I think I enjoyed the writing a lot more this time and the dialogue – which the film has kept surprising close to! I think when I originally read this I was hooked on the adventure, and, as I mentioned I did have a bit of a crush going on. More recently I think I was able to enjoy the quality of the writing and feel a little in awe of what Tolkien achieved. I admit, he’s not everyone’s cup of tea. I read one blogger, who was not a fan, saying ‘if you like to read a description of every leaf on the tree then give it a go’. Now, I wouldn’t necessarily agree with that but, and even as a fan, I can see where that person is coming from and I appreciate description isn’t for everyone. But, reading this again a few years later certainly didn’t detract from the experience for me. I also think I took my time a little bit more, admittedly that could simply be due to the fact that I wasn’t racing to the end to see how things wound up or it could be because I’m more patient now! Even if I’m not more patient I think the real difference is that I’m more prepared to read into things now than when I was younger when I was much more about the swashbuckling, swords and sorcery. Did this have any lessons for me? I think I could appreciate Gandalf’s words of wisdom more this time around – particularly in relation to the fact that Bilbo had shown Gollum pity rather than killing him when he had the chance – he after all plays a big part in the journey. So perhaps the lesson is ‘fools rush in…etc, etc’! Just finished reading the final instalment of Return of the Kings, the journey has finally reached its conclusion 😦 – sad because it’s now ended. Oh, my, god, I did want somebody to kill Saruman – but I think that if one of them had done so it would have been like a blight on their own character. As it turned out, one bad soul killed the other which felt almost fair! Which sounds a bit wrong given that they both ended up dead ultimately but it was inevitable. At first I was almost thinking that if Gandalf had just sorted Saruman out then it wouldn’t have been so dire for Hobbiton but I think Tolkien was giving the Shire a chance to stand up and show it’s metal. And, I liked seeing the way Merry and Pippin came into their own like battle-hardened warriors. Well, I’ve already probably covered this above – it was a surprise, and I have no recollection of reading this the first time (maybe I skipped it ‘oops’) – plus did this happen in the film – I can’t remember it doing so? Anyway, no the shock is no less a surprise because I genuinley had forgotten! Okay, my first thought was to say that Sam changed more and that Frodo couldn’t change and carry on with his life like he had before which is why he left. Then I thought, mmm, actually, no, Frodo changed the most which is why he could no longer live the same life as before. Okay, I was having a bit of internal conflict with this one but I’ve made my decision: Frodo. 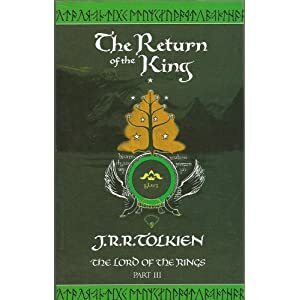 The conclusion of part 2 of the Return of the King takes us almost to the end of the tale, the ring and the enemy has been destroyed and Aragorn has returned to Gondor to be crowned King. I was seriously behind with this second part of the read along and I don’t know why but some parts of this section seemed to drag for me more than others. Anyway, finally got there and my answers to this weeks questions are below. Questions this week were provided by Carl at Stainless steel droppings. After witnessing the events of Denethor’s demise, what are your thoughts on him as a father and as a ruler, especially when compared to what happened with Boromir and the Ring. Well, it’s no secret that Denethor is not my favourite character! I liked him not as a ruler or a father. I think on reflection that Boromir’s quest for the ring was inspired by his need to impress his father and return to him something that he thought could be used as a weapon. I also wonder whether a lot of his sadness in the chapters before he died was really sorrow over the death of Boromir or sorrow that his plans had not come to fruition. He also sent Faramir, his only remaining son on an impossible task that almost ended his life and was the cause of a great loss of life. In that respect he was not a great ruler – he cared little for the people who were at his mercy and dictated to them based on whatever whim was upon him without respect for their lives. So, although I’ve tried to disguise it (lol), I didn’t like him as a father or a ruler. Instead of riding into the city with pomp and circumstance, Tolkien pens the king’s return as a clandestine act in which he demonstrates his rightful place through the act of healing the wounded. Your thoughts? I think that Aragorn didn’t want to return as the King whilst Faramir was ill – he returned to heal the wounded but he didn’t want to be seen as the King maybe because it would have looked a bit sneaky as though he’d taken the throne while Faramir was unable accept or deny his claim. Plus, I think, they had won the battle, but not the war and so it seemed a little early days to be wanting to return to the city with due ceremony. For one chapter Sam got to be rescuer and ring-bearer. What are your thoughts about Sam’s brief time as a ring-bearer in comparison to the others who have born the ring, or wished to? I loved when Sam was the ring bearer! Everybody else envisioning themselves taking over the world with the help of the one ring, Sam envisioning a huge garden! You have to love it. And even after that he realised this was just a dream that would never come to pass. In a twist unexpected in many hero tales, Tolkien ends the journey into Mount Doom with Frodo ultimately failing at his task. How did you feel about this and ultimately how does it make you feel about both Frodo and Gollum? I suppose it shows the strength of the ring in that at the end it had overcome Frodo as well, if it hadn’t been for Gollum (and his clumsy stumbling feet) the ring would not have been destroyed after all – as neither Frodo or Gollum would have done so. I don’t think this makes them weak, after all Gandalf and Aragorn didn’t even want to touch the ring because they were so fearful of what they would become. To an extent it makes you wonder if Gollum could have been redeemed – until you remember that he did murder his friend to gain possession of the ring before he’d even touched it. Given that The Lord of the Rings is largely about an all male cast, what are your thoughts about Tolkien’s portrayal of Eowyn now that we’ve seen the course of her journey through these culminating chapters of her story? I think that Tolkien was very forward thinking when you read this book and think about when it was written. He didn’t overlook anybody – all had a part to play and without Eowyn’s part the ending would have been completely different. It would have been so easy for him to simply keep her in a different place and give that part to somebody else but he let her have a role. Just like the hobbits, at the end of the day they were greatly overlooked by most and yet they also proved invaluable. I guess he was trying to show us that everyone counts and can make a difference. I was a bit surprised when Faramir and Eowyn were in discussion and it almost appeared that Eowyn only sought Aragorn because she would become a queen. I hadn’t really put that together before then – it made me almost a bit disappointed. I got that Eowyn had feelings for Aragorn but this made them seem a bit more shallow. I could be reading that bit wrong though – maybe I should reread. The “assigned” sections for part 3 only take us to the end of the actual story. Will you be reading the appendices? Mmm, nope! I was going to try and kid everyone (including myself) but the answer is ‘hell no’. Sorry, I’m such a quitter!!! What were your thoughts of Merry and Pippin in the preparation to the Battle of Gondor. It seemed that each ruler just thought that each hobbit could not be a contribution to the battle. I felt sorry for both Merry and Pippin to be honest. They both seemed to suffer the loss of each other when they were split up – and frankly the split almost seemed on a bit of a whim now when you reread the book . It felt very much like both had become an encumberance – they were treated a bit like a child who you humour with your patience when you have the time but then want to shoo them away to one side when things become more serious. But, at the end of the day, and though they might be small in stature, they are both adults – and they both wanted to contribute. I really liked that they eventually both proved their worth in more ways than one. Without Pippin looking in the palantir the battle would probably not have been as accelerated as it was – which was a good thing in a way because it meant the battle wasn’t as well planned as it would otherwise have been and without Merry’s intervention on the battlefield things could have gone horribly wrong. I like the way that Tolkien manages to give them, and the Lady Eowyn, a valuable contribution. Did you think that the preparations to the Battle sparked your interest and all or did you find that the flow was bogged down a bit? I suppose I did find the preparations a little more ‘sluggish’ than the rest of the book – which is to be expected in this type of novel, you have these chapters that totally raise you up and throw you into battle and then you have the lulls in between. But, I am a stickler for detail and if it wasn’t in the book I would probably find it very irritating. I did find it really interesting to read about the Wild Men who assisted the Rohirrim in finding a forgotten road to get more quickly to Gondor – Ghan-buri-Ghan was a funny character – didn’t like the orcs, and probably had no real love for men either but chose the lesser of the two evils in his eyes and struck a bargain so that his people could retreat to the quiet of the forest again. I thought that it was great that both Eowyn and Merry made it to the Battlefield. Yet against orders of the King and made a huge contributions. What did you think both of them doing this and would you have done this if it was you? I loved Eowyn and Merry’s contribution – and in fact it proved pivotal – things could have been so very different (and bad) without their rebelliousness! Not sure if I would have been so brave – in fact I know I wouldn’t. Although I suppose you’re carried away on the moment really and probably not thinking you’re brave at all. What do you think of Denethor’s rash decision to send Faramir to hold Western Osgiliath against the hosts of the Enemy that outnumbered their own greatly? Denethor is one of the few people that I have very little sympathy with in the book. I really don’t like him and it makes me feel bad, even though he is a work of fiction, to say that, but I think he is so mean! Imagine saying to one of your children that you would prefer their death to their brother’s – OMG! I know he was grieving for Boromir but frankly he always had a preference by the sound of it. I thought he was wrong to send out Faramir to hold Western Osgiliath because frankly it was an impossible task and a tremendous loss of life. Just finished reading book 2 of the Lord of the Rings, the Two Towers, as part of our group read along. This final instalment of Book 2 took us from The Window on the West through to The Choices of Master Samwise. I really liked Faramir (a lot more in the book than the film) and thought it was interesting to read this section because it is actually quite different from the film. I think the film version makes Faramir seem a bit more weak and indecisive than the book. In the book he comes across as intelligent, dedicated, honourable and thoughtful. He treats the hobbits respectfully and questions them in a way which gives him the answers he needs. He also tries to give them wise counsel before they continue on their quest and although he understands the nature of what is before him he resists the temptation and therefore proves himself more resistant to the ring than his brother Boromir (although whether or not he would be able to sustain his resistance if he stayed longer in company with the hobbits is unknown). But, personally I think it was better that Boromir was included in the Fellowship. I don’t think he was always the wisest but to be honest the Counsel were not short of wiseness – Aragorn and Gandalf certainly don’t have a lack of knowledge – and maybe if Faramir had been included they would have had so many wise voices that they would have just gone round and round in circles and never made any decisions. Boromir – through his dissenting voice – quite often pushed the Counsel to make decisions almost as an adverse reaction to what he was saying, and, on top of that, he was the spur that Frodo needed to break with the Fellowship and continue to Mordor with Sam. I really don’t like spiders and the notion of a spider as large as Shelob gives me the shivers – in fact, I’d sooner climb up a mountain I think!. I think I would probably have preferred to look for an alternative if the truth be told but, in fairness to Frodo, he didn’t really have any other option did he? He was reliant on Gollum – he knew that he would eventually try something or betray them but whilst he seemed to be guiding them he had to trust him and the fact that Gollum was scheming meant he would never have revealed any other way to the hobbits (even if one existed). I suppose the other thing was that Frodo, having seen the army issuing forth from Mordor, now realised the urgency of his quest and so his choices were limited and the need for haste was paramount. Definitely not. One part of me thinks it would be so irresistable to be told the future and another thinks not (maybe the winning lotto numbers!). As it happens, having seen this particular vision of the future didn’t turn out helpful to Sam at all – although, interestingly, when Sam sees the vision he assumes Frodo his asleep, in reality however he thinks Frodo has died and he therefore makes the decision to continue alone – if he had stuck with his original interpretation of the vision things may have turned out differently! I think I would have reached the same conclusion as Sam, which is that the quest is too important and that it must continue to the end, even if the ringbearer has to change. I like the idea of Sam being the sidekick – just picturing him as Robin to Frodo’s Batman!! That’s a really good point – when I was reading the conversation between Gorbag and Shagrat the part that struck me particularly was their discussion about slipping off somewhere with a few trusty lads, somewhere with good loot and nice and handy with no big bosses – like the old times. So, you can gather from that conversation that they don’t like the war any more than anybody else – I like that Tolkien wrote it like this – I don’t think it made me like the Orcs any more but it does illustrate that in spite of the differences the enemy also wants to get things over with and have some semblance of normality. I’m really enjoying the read along – and particularly seeing the differences between the book and the film. It’s so long ago that I read the story that to be honest I thought the film was exactly the same and yet there are differences and I find it really interesting as these crop up – thinking particularly about the change in story regarding Faramir and how he lets the hobbits continue on their quest and also Sam and Frodo on the stairs and how they actually go in to Shelob’s lair together. I’m really looking forward to the final book!